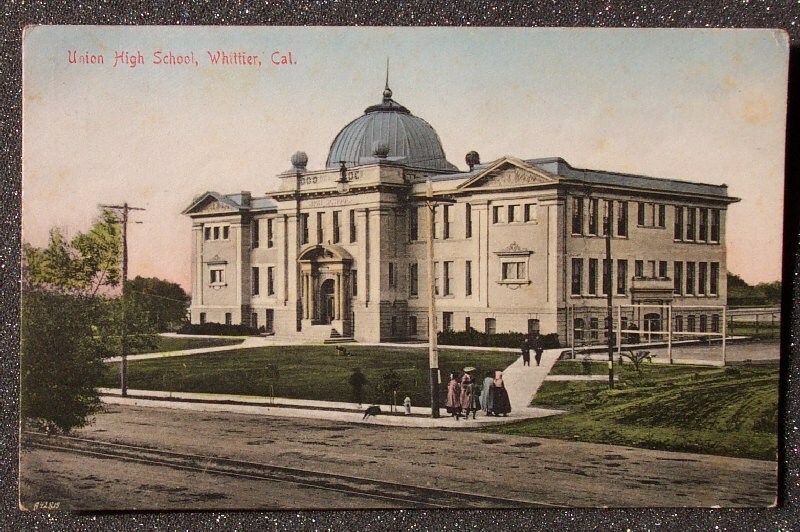 Whittier High School was established in 1900 when the few classes were in the upper floor of the old Jonathan Bailey School. At that time, there were 47 students in attendance. The classrooms included a study hall, a library, a recitation room, a science laboratory, and the principals office. The library contained one stack of books. For a heating unit, there was an old-fashioned wood stove. A few pictures and a statue of Julius Caesar ornamented the building. 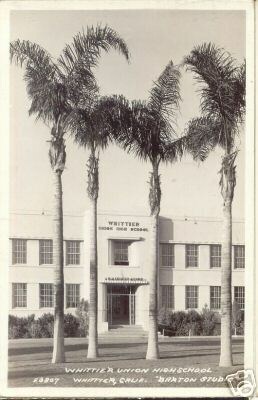 Following the addition of the East Whittier, Ranchito, Rivera, Los Nietos, Pico, and Mill Districts, the school became known as Whittier Union High School. In 1905 a new building was opened at the corner of Philadelphia and Lindley, which is the current site of WHS today. A rapid influx of students necessitated the constructions of a girls gym, an administration building and an auditorium in 1923. Soon after, the shops on Pierce Avenue were built. In 1933, an earthquake rendered most of the buildings unsafe. Classes were held in crowded storerooms, basements, and bungalows until condemned buildings could be reconstructed. The Science Building was rebuilt in 1934; a Boys Gym in 1935; dressing rooms and Cafeteria in 1936. The Auditorium stood idle for almost 20 years and then was renovated into our present Library. In 1938, the District approved bonds for a new Girls Gym and an Auditorium. Both were completed in 1940. Following World War II, the Whittier area began to grow rapidly. In 1952, the student enrollment was over 3,500. It was at this time that the District opened a new high school called El Rancho. Growth continued and in 1953, California High School opened, followed by Santa Fe in 1955, Sierra in 1957, Pioneer in 1959, La Serna in 1961, and Monte Vista in 1964, By 1966, the District had almost 16,000 students in seven schools. Because of declining enrollment, two of the schools closed in 1979. Many students from the Sierra High School area came to Whittier. Since that time, Whittier High Schools enrollment has slowly increased each year. From government sources (including FEMA) and bond financing, monies have been obtained for district-wide structural repairs. The seismic repairs and remodeling are still under way. In 1999 the Boys Gym was destroyed by fire. The new Perry Gym opened in 2002. The Holloway-Poucher Aquatic Center was completed in 2001. Other buildings and areas on campus are named after alumni and members of the Cardinal Community: The O.C. Albertson field after our first principal, the Myron Claxton ('36) Science Building, the Vic Lopez ('46) Auditorium, the Bob Chandler ('67) Sports Complex and the Marion Wilson Hodges fountain, also a former principal. The new Cafeteria/Multi-Purpose Building opened in Nov. 2009. The fields were re-done in 2012-2013 and WHS now has a new all-weather track, new softball & baseball fields & dugouts. 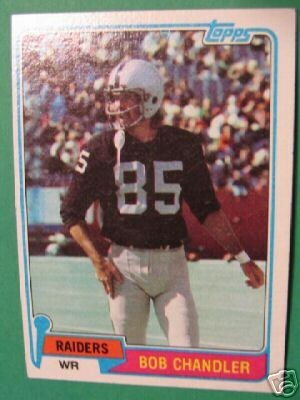 For one year our sports teams were unable to practice or play on our site. It is nice to be back on our "home" turf again. Go Cardinals! 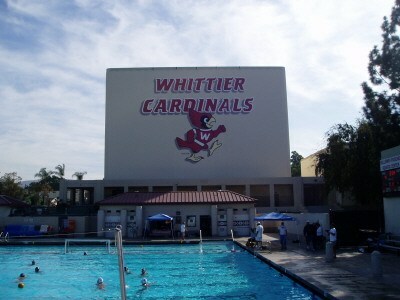 In 1930, the Cardinal was chosen as the Whittier High mascot because it is a native of Mill Creek (the area just north of Rio Hondo College). The bird was chosen because of its scarlet coat, which corresponded with the school colors. It was also felt that this bird possessed the same spirit and determination that has always been representative of Whittier High School. 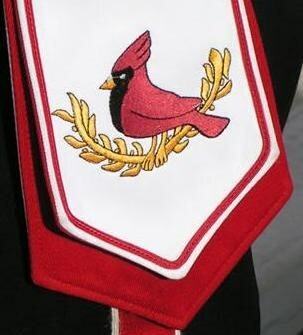 In 1935, the Cardinal insignia was designed as a result of a contest, which lasted four months. The event was culminated by a special student body election to choose what has become the Cardinal insignia. Since then, the insignia has been used on class rings, pins, the Cardinal Key, and a victory flag.